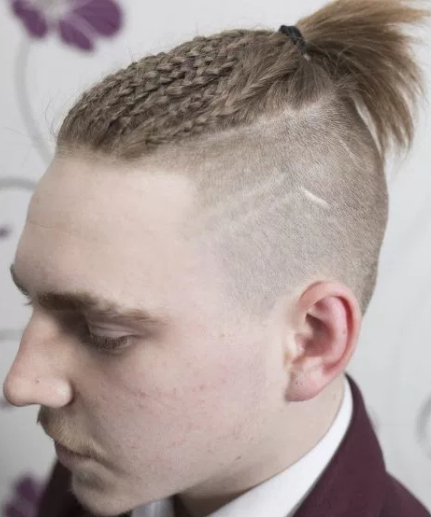 A woman claims her son was sent home from school after turning up for class with his hair in braids. 34-year-old Trisha Jukes says her son Jordan Waterfield was first sent to isolation before teachers ordered him to leave the school. 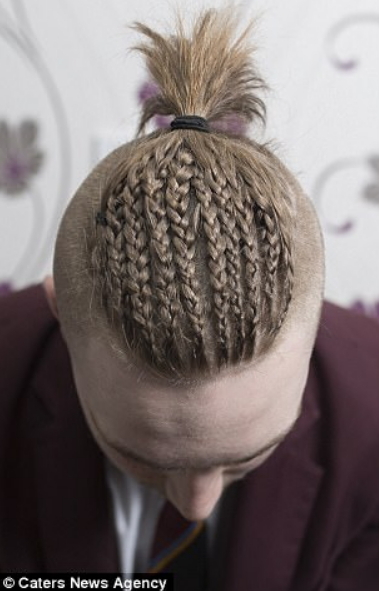 The 15-year-old had returned after half-term with the top of his hair braided, while the sides were left long. 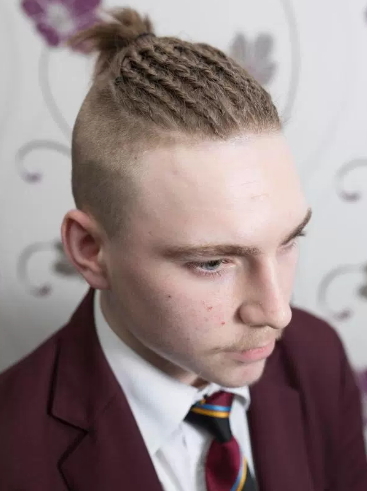 However staff at the RSA Academy in Tipton, West Midlands, sent Jordan straight to isolation for his ‘extreme haircut’. Ms Jukes claims she then received an upset phone call from her son who said she had to pick him up from school. She said: ‘I never imagined there’d be a problem with Jordan’s hair, girls go to school with plaits in, so why couldn’t my son. ‘As soon as I found out that he was put in isolation I was shocked, his hair cut wasn’t bothering anyone. ‘It’s a shame that he has missed out on a big chunk of education for the day just because of his hair. Ms Jukes rang the school and after speaking to multiple members of staff she claims the school retracted their decision and told her to bring him back the same day. ‘Jordan has been going to that school for four years and nothing like this has ever happened with regards to his hair. ‘His hair cut wasn’t doing anything to effect his learning – but sending him home from school is. ‘The braids were only tied together by small black elastic bands – and the rest of his uniform was immaculate. ‘As soon as Jordan returned home last Wednesday at lunchtime, I spoke to the school and complained. In a bid to tidy up his hair, Jordan had his hair cut shorter and opted for two small shaven lines into his hair. But Ms Jukes claims this enraged the school even further and he was later put in isolation once again. CANT BELIEVE D BOY IS A MINOR ,HE LOOKED LIKE 28YR OLD MEANWHILE UK AND REST OF THEIR PALS PREACH FOR GENDER EQUALITY AND NOW GETTING OFFENDED WITH A SECONDARY SCHOOL MALE KID BRAIDED LIKE A FEMALE.UNA NEVA SEE ANYTHING. ofcourse plaiting of hair ain’t for female alone bt both sexes,if I had a son God punish any teacher that will chase him out of his class. Stanley Jones don’t you think the school authorities had made the best decision so far? the school has its own standard and regulations. If this boy will make bad influence among his peers then the school authority has every right to suspend him. His mother should realize that the school is different from home. That boy can behave the way he likes at home but not in the school. If other kids are following school rules what makes you think they will make separate rules for him? Stanley Jones, you are one of the bad influence as a parent for allowing your son looking irresponsible in the name of modern fashion. You are one of the reasons why our society is the way it is now. The purpose for that boy going to school is to learn not only academic part of education but also moral part in order to be an effective future leader. The school authority should not only suspend him but permanently bar him from coming back to that school in order not to corrupt the good ones. Until he and his incapacitated mother trying do the right thing, let him continue his schooling at home. He is going to cause terror in that school very soon,they have wounded his self esteem.